The first several games of Fowler's 2019 looked distressingly similar to last season's career-worst campaign. 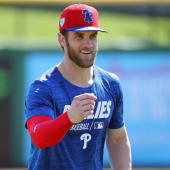 However, the veteran outfielder appears to be heating up the more reps he gets, as he's now hit safely in four straight games and laced a two-bagger in each of the two contests against the Reds over the weekend. Fowler has yet to leave the yard over his first 48 plate appearances, however, and his strikeout rate currently sits at a career-high 29.2 percent over the modest sample. Assuming that number eventually settles somewhere in the neighborhood of his three-season average of 21.8 percent, Fowler could continue to see his current .220 average progressively rise.